Coastlines of the world are as diverse as any geological setting on Earth. Beaches and Coasts is an exciting and unique new textbook that provides an exhaustive treatment of the world's different coasts and details the highly varied processes that have shaped them. Having conducted research on coastlines throughout the world, the authors draw on a wealth of experience that broadens the content of chapters and provides for numerous and varied examples. The book furnishes a basic understanding of the tectonic framework, hydrographic regime, climatic setting, and geologic materials that determine the morphology of a coast. Individual chapters are devoted to major coastal environments such as barriers, tidal inlets, marshes, estuaries, lagoons, deltas, glaciated coasts, rocky coasts and many others. Beaches and Coasts provides the necessary content for teaching a broad coastal geology course. Though designed for introductory students, its comprehensive treatment of coastal topics will make it appropriate for many upper level courses. Exciting and unique textbook that provides an exhaustive treatment of the world's different coasts and details the highly varied processes that have shaped them. The authors draw on a wealth of experience that broadens the content of chapters and provides for numerous and varied examples. Provides a basic understanding of the tectonic framework, hydrographic regime, climatic setting, and geologic materials that determine the morphology of a coast. Individual chapters are devoted to major coastal environments such as barriers, tidal inlets, marshes, estuaries, lagoons, deltas, glaciated coasts, rocky coasts, and many others. Provides comprehensive content for teaching a broad coastal geology course for both introductory and upper level courses. Richard A. Davis Jr is Distinguished University Professor Emeritus at the University of South Florida. He has spent the past 40 years studying coasts throughout the world. He specializes in beach/inlet/barrier island morphodynamics and Holocene history of coasts. 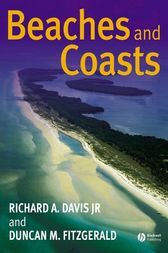 Dr Davis is the author/editor of twelve previous volumes, most of which are on coastal topics. Duncan M. FitzGerald is an Associate Professor in the Earth Science Department at Boston University. During the past 25 years he has studied the morphodynamics and hydraulics of tidal inlets, the stratigraphy and evolution of barrier systems, and sediment transport in estuaries. This research has taken him to coasts throughout the world resulting in numerous professional publications.